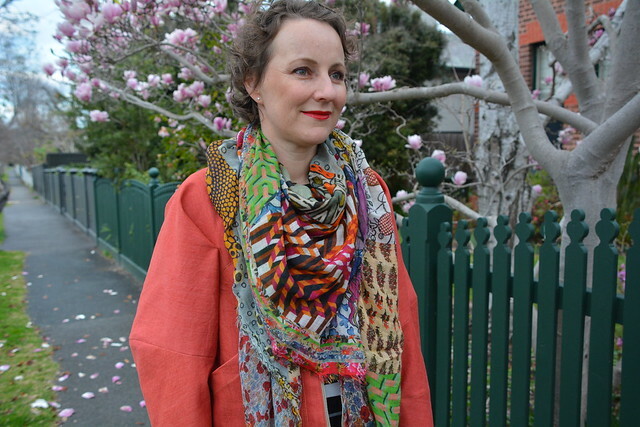 Every-time I catch a glimpse of my new Falda Jacket I’m amazed that I actually made it… and of course in awe of the pattern making skills required (take a bow Pattern Fantastique) to create such unique, bold and edgy, but yet totally wearable, garment. This project definitely made my brain work a little harder than is normally required when I sew, but it was oh so worth it. I’m beginning to see the correlation between challenging projects and increased sewing satisfaction levels. This jacket has been ‘in progress’ for quite some time. 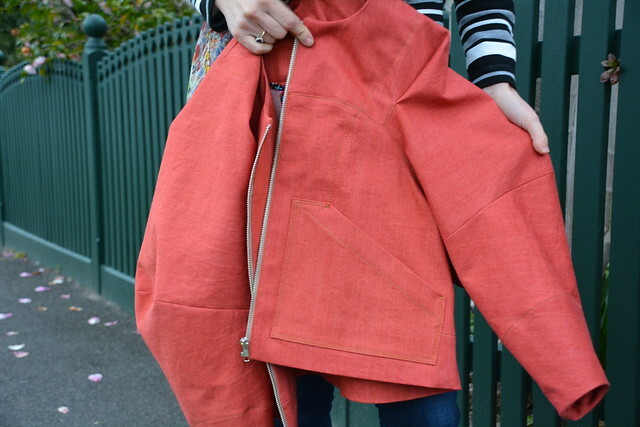 I purchased some rust coloured denim from House of Cloth in Bendigo (a big shout out to my fabric scout Sarah and her Mum for acting as the courier!) 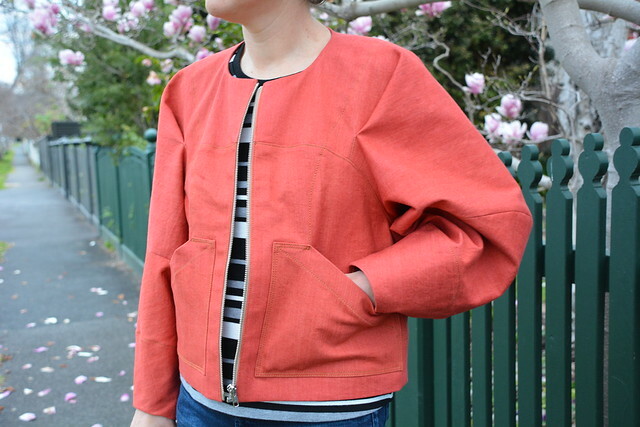 just after I had finished sewing my first Falda Jacket 18 months ago. Did I mention that ‘big projects’ often daunt me and take a long time to find their way to the top of my sewing queue? I cut out View A (an unlined version with patch pockets) in April, took it away with me on a sewing weekend that same month and made a good start. Sometime in July I had the head-space to insert the zip (always a challenge for me!) and add the neckline facing. 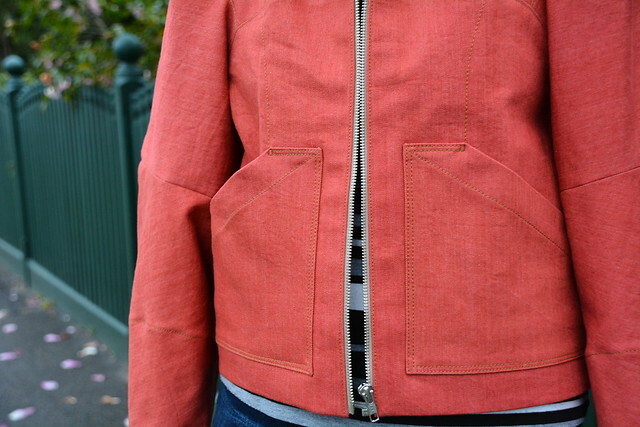 I then finished the jacket on another sewing weekend in August. Slow and steady wins the race right? I bound the edges of some of the internal seams… not all of them (I prefer to stay sane) but enough to give the insides a little bit of a lift. 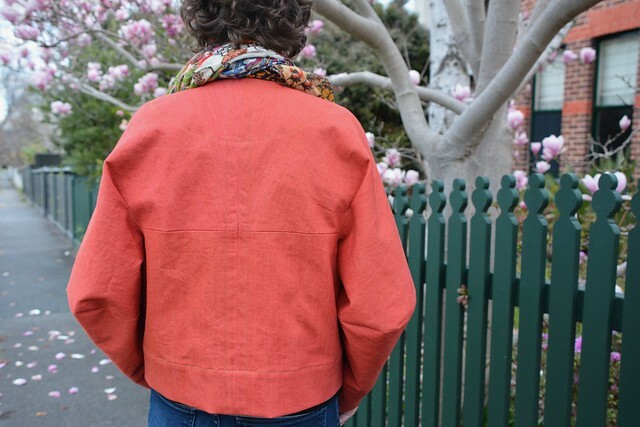 When I sewed my last Falda Jacket I was nervous about the top-stitching so I used all purpose Gutermann sewing thread in a matching colour. This time I felt ready to tackle proper top-stitching thread… you know the real deal in a visible colour! Thankfully my Bernina Record 730 (a vintage machine from the 1960s) is a workhorse and it managed the multiple layers of denim and top-stiching thread without one complaint. When sewing with top-stitching thread, I use a normal all-purpose polyester thread in my bobbin and, in this case, a denim needle. After this project, my top-stitching fear has totally disappeared. 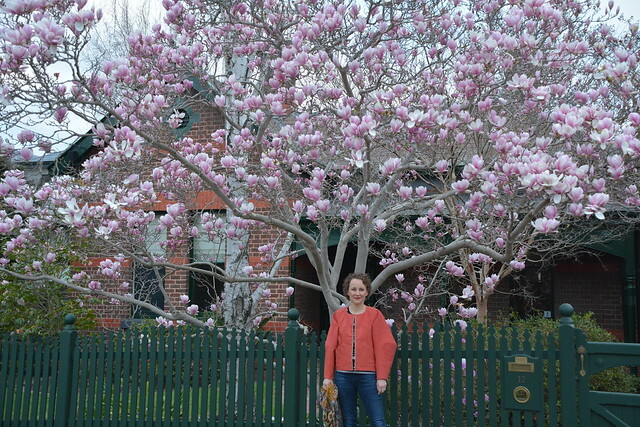 And to finish, some photo to show-case those seriously big sleeves and a spectacular local magnolia tree. What a beautiful jacket! 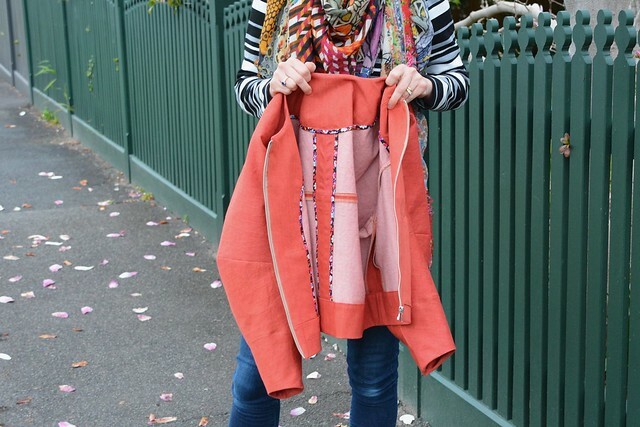 Great piece for changing seasons and what warm coral suits you well. Thanks for the jacket love Sarah Jo. I have just invested in a set of Lykke interchangeable circle needs but I’m yet to use them. I have brought quite a few sets of Addi mental tipped needles and I find that I can knit a bit faster with them (they have more slip) but I like to have wooden needles for plane trips… and that’s were a lot of my knitting happens. Hence I invested in the Lykke set. Clear as mud? It’s the best colour and it makes my heart sing. You know me well! Lovely Anna. Superb finish and gorgeous colour. Obviously special store where material was sourced! 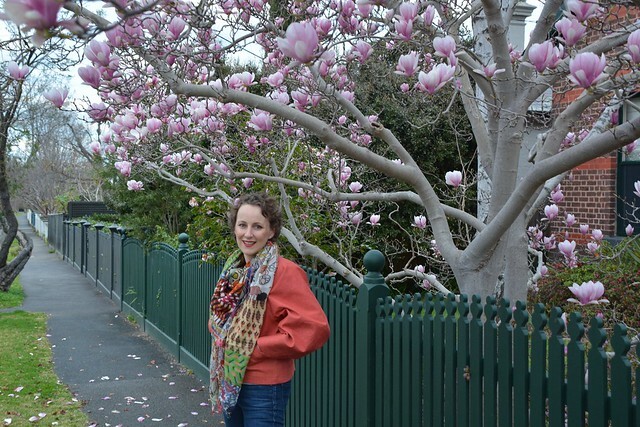 Stunning magnolia background. Thanks for you help Jenny. 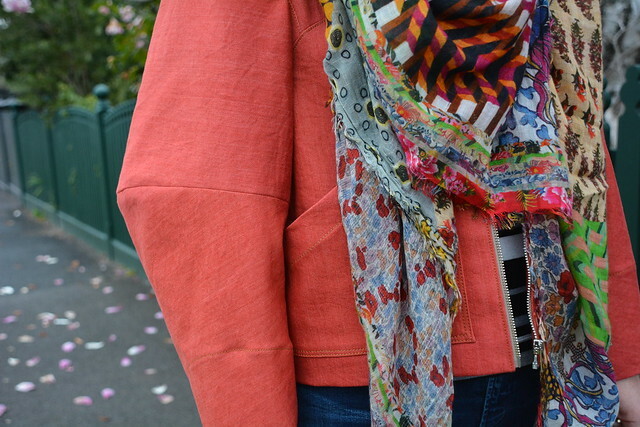 I strongly believe that this special fabric made the jacket! 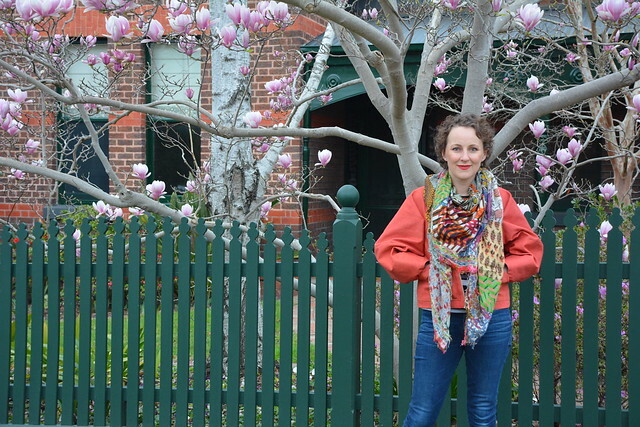 Oh how I love magnolia season… partly because they are stunning and partly because it means the warmer weather is on it’s way! Thanks for the top-stitching love Jackie. I’m a total top-stitching convert. Amazing colour, looks gorgeous! House of cloth have some lovely fabrics! They definitely do Dianne. I’ve only visited the shop once in person but it was a very lovely curated collection. Such a fabulous colour on you and yes, a seriously mind boggling piece of patternmaking I agree! I so love a good magnolia and that’s a beauty, hopefully fragrant too?NIce work on the topstitching. Thanks for your kind words Lesley. 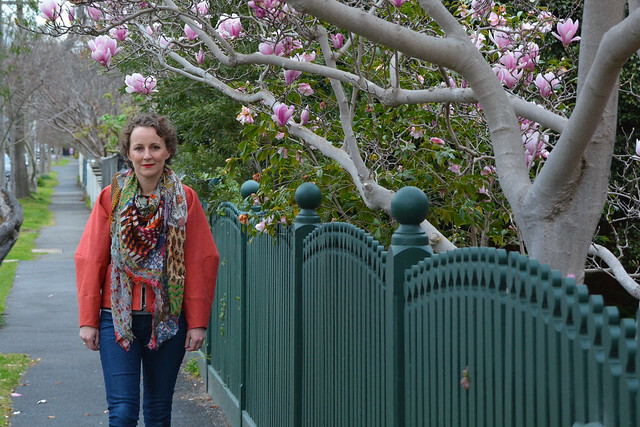 Sewing and magnolias make my heart sing so I’m pleased to have combined the two in this blog post. 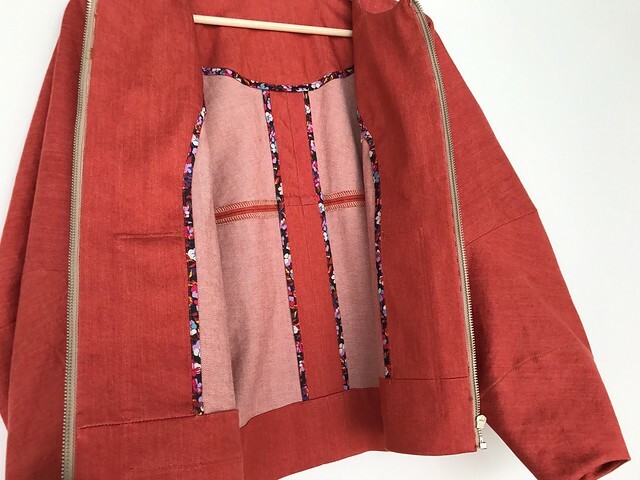 Now you’re talking my language, Anna – slow and steady sewing! haha. The jacket is fabulous – I’ve been staring at the line drawing of it for the better half of the last five minutes. Your topstitching adds so much to it – and is impeccable. I can image that would have been a little nerve wracking! I need some more slow & steady sewing Mel as the end result brings great joy. Maybe their is a french jacket in me yet!